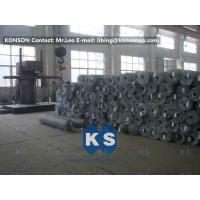 Home Companies Konson Industrial Co., Ltd.
1. Konson Galvanized Gabion Box. Gabion is basket or mesh roll made of twisted hexagonal wire Mesh, Gabion box is filled with rock at the project site to form flexible, permeable, monolithic structures such as retaining walls, channel linings and weirs for erosion control projects. Gabion wire mesh is ideal material for flood prevention and flood control in protecting and support seawall, hillside, road bridges, reservoir and other civil engineering in the form of mesh containers filled with stones. Gabions can be designed as your request. It is the most common and most practical kind that is used in the project. 1,Economy. It only needs to load stone and then to be sealed. 2,Construction is simple, without special skills. 3,A strong withstand natural damage and corrosion resistance. 4,Withstand large-scale deformation, and does not collapse. 5,Cage rock crevice between the mud will be melted together by the surrounding natural environment. 6,Has good permeability to prevent the damage by hydrostatic. 7,Save transportation costs.It can be folded up for its transport.